Commuting between our home in Antipolo and my work place in Quezon City, I have noted a lot of issues on transport and traffic that needs to be attended to by the local government in coordination with other entities like the DPWH and Meralco. Here are some photos with my notes and comments. Much of Sumulong Highway have been widened to 4 lanes but many electric posts remain in the middle of the additional lanes and pose hazards to motorists and cyclists. These posts seem to have been here for quite some time now and the paint on them gives the message that they will be here for the foreseeable future. Paint or no paint, they are road hazards and have the potential to kill people on vehicles crashing into the poles. I think this is supposed to be the responsibility of the power company (Meralco) but there needs to be a firm request and coordination coming from Antipolo City Government to finally relocate these poles. Congestion is often caused by counter-flowing vehicles forcing their way back into the right lane (like the car in the middle of the photo) upon encountering opposing traffic. It doesn’t help that there are motorcycles splitting the lanes to make for a very crowded road. The new but still closed Antipolo Public Market along Sumulong Highway and near the intersection with Daang Bakal (the old railroad line that’s now a road). I wonder about the trip generation potential of this complex as it is not yet operational. Meanwhile, a huge Robinsons mall (looks larger than their Magnolia property) is currently under construction just across from it and will definitely be a major traffic generator in that area. The combined traffic to be attributed to these commercial complexes will surely have a tremendous impact on Sumulong Highway and other roads in the vicinity. Both Sumulong Highway and Ortigas Avenue Extension carry significant truck traffic. These often cause congestion as they are slow going up to Antipolo and can block the entire road as Sumulong Highway and Ortigas Extension have some narrow sections where the shoulders could not provide enough space for other vehicles to pass the slower moving ones. In certain cases like the one in the photo above, there are electric posts in the middle of the shoulder lane. 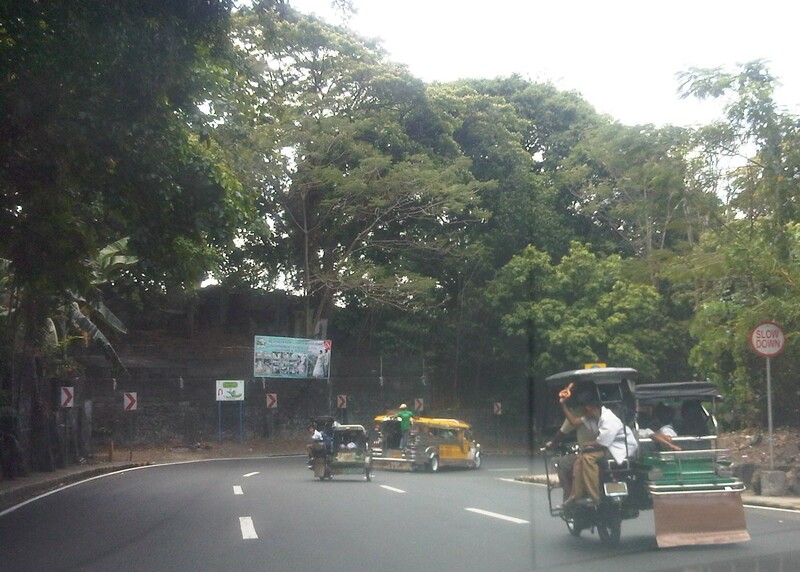 Tricycles occupy the outer lane of Ortigas Ave. Ext./Olivares Street. Such informal and on-street terminals are illegal along national roads and yet the city tolerates them. One explanation for this is that there are informal communities along the highway on shanties built along what is supposed to be a ledge along the mountainside (shown at right in the photo). 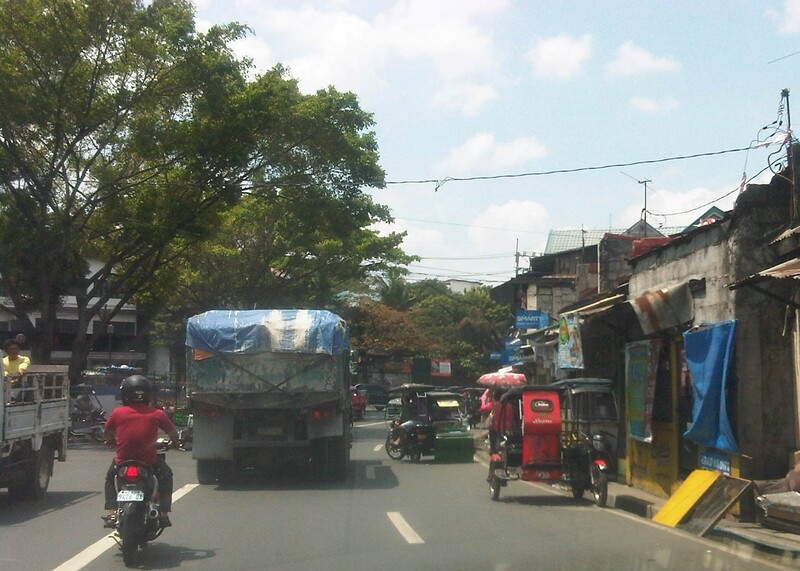 These are where tricycle drivers and their families reside. 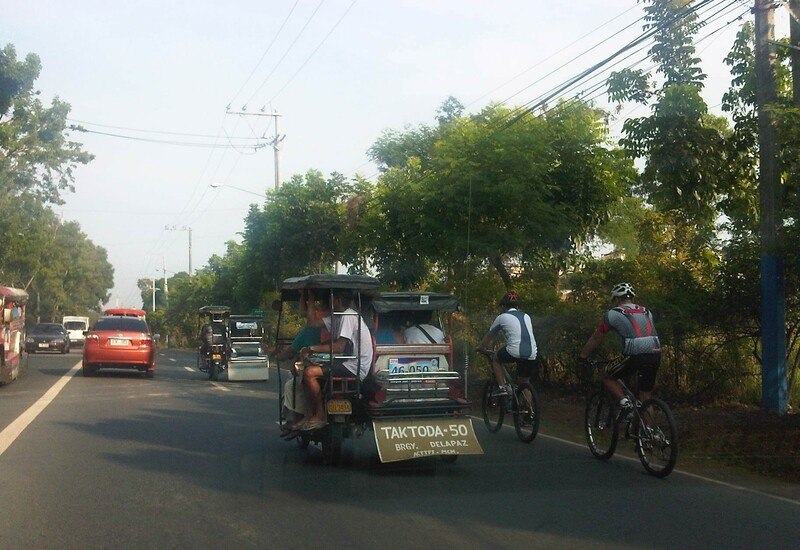 Tricycles from different tricycle operators and drivers associations (TODAs) seem to roam the entire city. This is contrary to the common practice in other cities and municipalities where tricycles are limited within a certain area or district that in many cases just overlap with others (e.g., UP Teachers Village-Philcoa-Krus na Ligas). Many tricycles serve as school service. However, the observation is that most tricycles tend to be overloaded with passengers. These are usually small children so the driver probably figured that they could cram more passengers than what is legally allowed. Sharing the road? Antipolo is very popular with cyclists and weekends bring a lot of them to the city as they come from all over via the main routes along Sumulong Highway and Ortigas Avenue (there should also be those coming from the east via the Antipolo-Teresa Road and Antipolo-Tanay Road). Most motorists are aware of these cyclists and give way to them. Most experienced cyclists are also aware of the ROW of other vehicles and so keep to the inner lanes. This mutual awareness and respect are vital to make roads safe for all. I think the only thing needed is to provide space for pedestrians as there are significant numbers of people walking, hiking or jogging along these roads. By d0ctrine in Behavior, Governance, Jeepney, Motorcycles, Pedestrian, Policy, Road Safety, Terminals, Traffic Congestion, Traffic Management on May 30, 2014 .